Yesterday, was my last hunt with Bob for the season. It was also Bob’s last hunt. We’d hoped he’d last until the end of the month but tomorrow he’s undergoing spinal surgery. Our life for the past three months has revolved around his spine. Yes, our life. It’s not that it’s getting in the way of hunting things; we’ve spent many hours in the car together traveling back and forth for medical-related appointments and things, and his spine affected our ability to travel out of state to visit family over the holidays because sitting in a car or plane would be unbearable. We’ve missed going to see his students play basketball games for fear of being trapped in the bleachers when the pain would start up again. Bob even got to the point where he couldn’t go into the grocery store with me for even 5 minutes so he could pick out his own yogurt and cereal since I can never remember what kind he likes. Our time together spent moving up and down the chukar hills with the dogs looking for birds and being totally in the moment was the only time he said he forgot about his pain. When it did act up, the dogs were confused by him suddenly stopping to lay on the ground to get into a position that would lessen it. Yesterday morning was spent doing chores he won’t be able to do after his surgery and other last minute things before heading out to hunt. Because of my lack of experience running our snowblower up and down our driveway by myself, we spent 15 minutes going over how the beast worked. I started out taking notes on a piece of paper but Bob suggested a video on my phone might be better so it would make more sense later. I think he’s right. He knows me better than I know myself. Opting out of hunting for the day and knowing I’ll have more chances before the season ends on January 31, I wanted Bob’s hunt yesterday to be for himself and for him to experience every point, every flush, and retrieve with both dogs. When Bob and I hunt together, Peat goes with Bob and Angus usually sticks with me. My fear every time we hunt with Angus is that we might lose him. This season because he’s almost totally deaf and going blind he’s relying more on his fine-tuned nose to find birds and because of this he’s ranging farther than he normally does. Layers upon layers on our ascent from the valley below. Angus still moving like a young dog. He’s only getting better each season. Heading up into the hills from the place Bob decided he wanted to try hunting, he wasn’t totally alone. I decided to follow along hoping to capture the pure essence and gorgeous landscapes of everything around us. It was just like the old days before I started carrying a gun; I’d be hot on his heels for every square mile hoping to catch with the camera some of the action and beauty of the sport. Looking down from the rocky outcroppings on the delicate hoarfrost covering the fresh green-up, the fragrant sage, tall pine trees, and the luminous light on the hillsides made an idyllic last hunt. The steadfast and confident points by Angus and the slow and very intense creeps of Peat backing him was stunning to witness. Peat taking the lead for a change. Angus pinpointing chukar scent; he’s as good as ever. Chukar hills as far as you can see. Peat’s fast feet gliding across the terrain. Moving into position in front of Peat’s point. Angus pointing chukar in the sage. Lastly, yesterday on our long descent hunting down the ridge on the soft and muddy south-facing slopes, the dogs would lead us to frozen but protected draws. I witnessed the wonderment and fair chase of the wild busting coveys of chukar fueled by swirling cold winds now at our backs, and the curious mule deer we awakened from his nap in the tall grasses tucked next to the sage. All birds quickly disappeared over the next ridge, followed by the dogs who continued to work hard like they always do to find the same or another covey. Our relationship has been a challenge the past three months. We both vowed in sickness and in health or something like that a long time ago. I know first-hand and intimately the fear patients face the second they set foot into a hospital. I worked in a major medical center as a patient care provider for 36 years, and the roles are reversed now: it’s not easy having a loved one on the receiving end and to witness his anxiety and fears of not knowing what might happen next, and the anticipation of general anesthesia, and knowing you are depending on someone or something else to breathe for you. Finally when the surgery is done, the long-term recovery, the medical bills in the mail that will soon follow, the reality that all of us are getting older and are slowing and falling apart: sometimes it’s hard to deal with or fathom. We are some of the lucky ones to have health insurance, sick leave accrued, and money that we stashed away for a rainy day microdiscectomy. The weather forecast for tomorrow and the rest of the week calls for a chance of snow and then rain. I have read about your pain through the season. I had the same issue last year and had surgery right before the start of the season. It was a rough couple months, but I hunted like crazy this year. I missed the entire 2017-18 season. You’ll be back at it in September. I hope all goes well, and your back on your feet soon. best of luck with your surgery. Went thru the same thing last year with a herniated disk and it was so worth having the surgery. You will be back on your feet in no time. Good luck with your back, Bob. And that snowblower video? Going viral for sure. I hope we didn’t offend any Canadian’s if it does go viral. Bob entertains his kids and me daily with a variety of different types of accents. I suppose he could of used his Irish accent, they probably use snowblowers in Ireland? Good luck Bob (and Leslie)! You all have inspired my hunting and I am in your debt. Good vibes gliding your way from California. Your words are kind and true. Fear and pain in our spouse make yesterday’s vows too real. None of us knows what tomorrow brings. Pete has it best, like all dogs, he lives for today amid his limitations and worries not about tomorrow. My guess is that deaf and blind, he’s still happy to be alive. Perhaps like the hunting wisdom that says always follow your bird dog and not your own instincts, maybe Bob and you should tune into Pete and Angus and their modest worries: having a bowl of good food, a warm place to sleep and precious memories of the day’s hunt. Be well and may Bob’s surgery prove fruitful, his recovery short and may your dogs not miss you too much while the two of you are away. Fantastic pictures Leslie! You guys are living in the midst of magnificence. I’ll be praying for a successful surgery and recovery for Bob. The Docs can do some amazing things these days. I also know what back pain is like but fortunately my drug is motion…walking, hiking, cycling. Thanks for your comments and reading my post. Bob will be back out there soon…movement is medicine for sure. Bob and Leslie, I’ve been following you for about a year and I so much enjoy your writing of chucker hunting and your experiences I want to wish BOB the best of luck with the surgery. I will keep in touch, Rick . Very well written, as always. Good luck, Bob, you are not the first guy to have this surgery. It will be ok, I promise. Been there, done that, and I can still hunt chukar. Godspeed and best wishes from California. Here is to wishing skillfull hands to the surgeons and the team performing the operation. And to a fully healing recovery, and talented physical therapist. Sept 2019 will be calling your name to come play. Take it easy, fully heal and come back more ready than ever. Leslie will make sure the dogs dont miss a beat the next 8 months. What a moving piece of writing! I’ve been following this blog for 6-7 (?) years now and always loved the truly fine writing. I enjoyed following along as the two of you exchanged roles once you (Leslie) took up your own gun. Leslie, the images you’ve captured have been mesmerizing/awe inspiring. Sorry Bob. 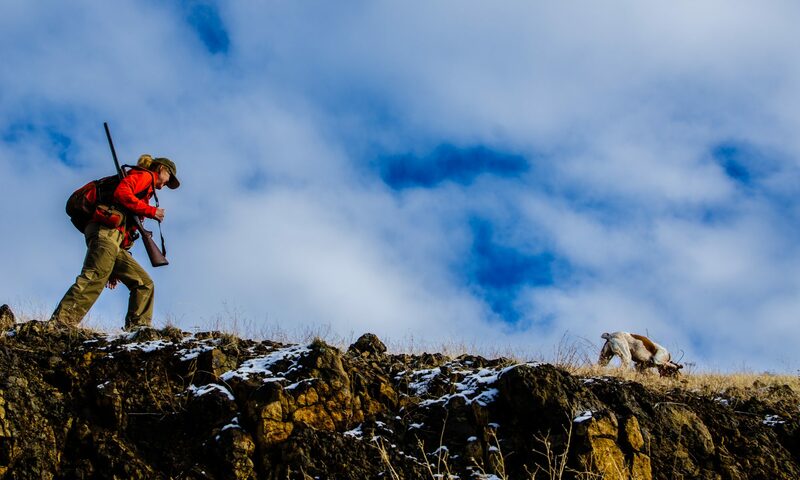 As much as I loved reading how your wife was taking to the sport…….she definitely has the keener eye for capturing the steep loneliness of the areas you hunt. I’m also of the same age….and yet I’m blessed with good health (thank you ancestors!) such that I continue to think, feel and act like I’m still in my 30s health wise. Yet, more and more, I’m facing the fact that many our age have no more days on this wonderful planet. I’m grateful for my breath. Thank you for sharing your lives in such an intimate manner…. I don’t consider myself to be religious but, I did spend some time (some even enjoyable) attending Catholic Church. I’m very appreciative of your comment and thank you for following our blog for so long. It’s been a fun journey so far that we hope to continue. Social media is weird sometimes but we’ve connected with people all over the world and have even made friends in real life with some of them. Best of luck. For some reassurance my 73 year old mother in law recently underwent spinal fusion surgery including a cage installed to support her severely deteriorated spine and she recovered within about 9 months and she’s frail. I’d say someone who hikes the Chukar mountains and is healthy like yourself, Bob, will have no problem getting back on your feet and getting back on the mountain within 5-6 months with a little determination and enduring some level of pain as you continue to heal. Best of luck and Get well soon.. we need you out there for the next season… after a spinal surgery is very important to keep your body in good shape and exercise. Doctor will say all this to you.. if you follow their instructions you will soon be back on the field. all the best!!! Best of luck on the surgery, have been there many times myself. And a wonderful post of the great day in the field. Those are the memories that help get you through rehab! My thoughts will be with you for the surgery to be 100% successful and return to your normal quality of daily life. Having had a herniated disk in both the C and L areas at different times, I can relate to the pain and disruption of activities. Fortunately both times for me PT and stretching solved the problem. Also, they were both in the off season and was able to walk the chukar hills unimpeded. My wife and daughter have had fusion back surgery with complete success. I am completely confident the procedure will repair the problem and you will soon be back to normal. Its obvious to me that you both have become a valued part of the local community and having everyone hale and hearty is an asset for all. Leslie and Bob best wishes to both of you from Italy. Thank you for sending get well wishes all the way from Italy and we both appreciate you reading our blog! Well, Leslie. Jim and I are sitting here crying at the beauty and weight of your prose and pictures, understanding that you are now in the midst of the hospital stuff at this moment. We knew the details all along, but you brought us into the deep sadness of being aware of our frailties–both in ourselves and in the people and animals we love. It’s a little shocking how much that first pic of Bob looks like his dad. We love you both and wait to hear how this day goes and what the prognosis is for his recovery. May this be one in which the patient does find that the spine of his use gets recovered and improved. We are holding that thought. Susan, I appreciate your very kind words. Bob & Leslie – as always, thank you for sharing your experiences with all of us. I always look forward to your new email in the in-box. Best wishes to both of you and a speedy recovery for Bob. Wishing you a full recovery. I feel for you having to put up with the hospital food they serve though. Beautiful and heavy stuff. I’m praying for Bob! Bob, best of luck with the surgery; I hope it goes smoothly and you get the desired results. The dogs won’t be able to keep up with you next season! I wish you and Leslie well and luck with the surgery. Hopefully a speedy recovery will have you both out enjoying your dogs, the scenery and finding some birds to boot. Wonderfully written and photographed! I felt like I was there. Healing prayers for Bob!